Aberystwyth Arts Centre is home to a thriving arts culture sited many miles from the nearest urban centre. Links with Ireland - westwards across the sea - are, in some instances, as strong as those with the rest of Wales and Britain. The Arts Centre approached us to explore possibilities for building flexible, low cost, medium life studio and office space - dubbed 'arts incubators' or 'creative industries business units' - linked to the main building. The space is to be let to organisations and companies engaged in 'creative industries', such as artists and media organisations, providing income for the Arts Centre and expanding the diversity of its community. 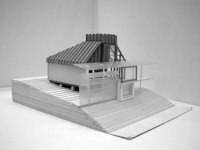 The design proposed is an essay in studwork faced with WBP ply. Ply is visually warm, remaining cheap and readily available. In the medium term - as the joinery at Le Corbusier's Maisons Jaoul and his own Cabanon has shown - it ages with grace, acquiring the patina of touch and use. Primarily, however, studwork and ply is readily understood. Anyone with a rudimentary appreciation of building can add to the construction intelligently, or subtract from it. There is also some environmental merit to this construction system. Timber studwork is both renewable and recyclable. And, although it can contain up to 50% glue, ply is at least partly renewable and has potential for recycling: second-hand, it is appropriate for rough shuttering or hidden construction. A series of pavilions are arranged along the bank opposite Percy Thomas' Great Hall. A raised walkway, enclosed with a lightweight timber frame and clad in polycarbonate sheeting, provides a garden wall which defines an edge to the 'events field' where the Arts Centre and University hold summer workshops and celebrations. The pavilions rise from behind this garden wall and punctuate it, with sitting places expressed at each entrance overlooking the field. These pavilions are not huts, or houses, or sheds, or studios, or offices. They have qualities which evoke all of these, yet none of them explicitly. Their iconography and materiality refer to the imagery evoked by the idea of each of these 'types', acknowledging an interest in 'everyday' imagery. Pitches to the principal elevation hint at domesticity, but the square-topped lanterns deny easy associations. The ply pavilions are set-out, internally, on the un-cut module of a standard 1220 x 2440mm. ply sheet. And they are characterised by the jointing, colour and sheen of the material. But concern with experiential qualities of the spaces and possibilities of iconography kept us from over-fetishising the material. Each pavilion - and two groups of paired pavilions - are divided with sacrificial stud partitions which are easily removed and reinstated to allow flexibility in letting arrangements. Spaces derive their character from a mezzanine level which inhabits and projects from each lantern, and the exposed splayed pitch of the roof which is ply-lined like the walls. Light comes from two directions: the lantern itself; and a horizontal window which frames the vertical trunks of the trees behind. The lantern window and mezzanine balustrade layer both shadows and views of the sky. Soane's house was influential here, particularly the haunting qualities of his breakfast room. Sunlight and clouds animate each space. Light is richest where its source is at least partially unseen, both as wash of daylight and glitter of sunlight, and its life here is intended to remain somewhat enigmatic.